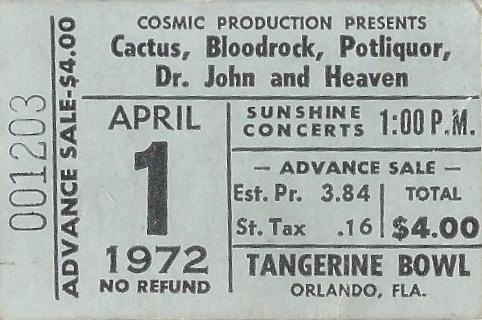 A ticket stub for a concert featuring Cactus, Bloodrock, Potliquor, Dr. John (b. 1940), and Heaven at the Tangerine Bowl, located at 1610 West Church Street in Downtown Orlando, Florida, on April 1, 1972. The ticket was $4 and the show began at 1 p.m. The Tangerine Bowl has been also known as Orlando Stadium, the Citrus Bowl, Florida Citrus Bowl Stadium and is currently known as Orlando Citrus Bowl Stadium. It opened in 1936 and has been home to numerous sporting and entertainment events throughout its existence. Cactus is an American hard rock and blues band formed in 1969 in New York. They were known as "the American Led Zeppelin." Bloodrock was an American hard rock and blues band from Fort Worth, Texas, that enjoyed considerable success from 1969 to 1975. Potliquor was a Southern Rock band from Baton Rouge, Louisiana, that formed in 1969 and disbanded in 1979. Dr. John, the stage name of Malcolm John "Mac" Rebennack, is an American multi-instrumentalist wh.ose music blended New Orleans blues, jazz, rock, and R&B Heaven was a British jazz-influenced rock band that formed in 1968 and disbanded shortly after the release of their 1971 album. Original ticket stub: Private Collection of Carl Knickerbocker. Aswell, Tom. Louisiana Rocks! : The True Genesis of Rock & Roll. Gretna, La: Pelican Pub. Co, 2010. John, and Jack Rummel. Under a Hoodoo Moon: The Life of Dr. John the Night Tripper. New York: St. Martin's Press, 1994. 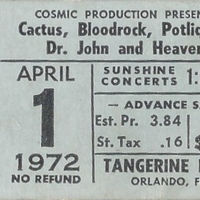 “Cactus, Bloodrock, Potliquor, Dr. John, and Heaven Ticket Stub.” RICHES of Central Florida accessed April 25, 2019, https://richesmi.cah.ucf.edu/omeka/items/show/4761.